This post explores the way the church and mission are related and developed in three documents written between 1951 and 1967: “The Church in Missionary Thinking” by J. C. Hoekendijk (1952), The Missionary Nature of the Church by Johannes Blauw (1962), and The Church for Others, published by the World Council of Churches (1967). In conclusion, I offer reflections on the resonant and discordant perspectives therein. In “The Church in Missionary Thinking,” J.C. Hoekendijk lamented how ecclesiology had, in recent decades, swallowed up mission. It had done this, he points out, by using such concise verbiage as that offered by Dr. Durr: “Mission is the road from the Church to the Church” (324). Indeed, the church had, in his view, both eliminated the world by making it a “a sort of ecclesiastical training-ground” and dealt with the kingdom by either subsuming it within its ecclesiastical bounds or relegating it to far off in the eschatological distance (324). Hoekendijk labeled this way of thinking church-ism, and asserted that younger churches had assimilated it to the point of expecting an independent church to be a “Church-free-from-the-Mission” (327). Years of this church-centric obsession, Hoekendijk asserted, had born no greater clarity in mission thinking (332). Thus, he proposed an approach which disconnected mission thinking from this “illegitimate centre” (332). In his approach, ecclesiology was to be explored in “framework of kingdom-gospel-apostolate-world” (333). For Hoekendijk the world was both central to mission thought and a necessary pairing with the kingdom. Indeed, kingdom and world are the “decisive terms of reference” (335). Within this paradigm, Hoekendijk acknowledged the church is neither the starting point nor the end and, in fact, “has no fixed place at all” (334). 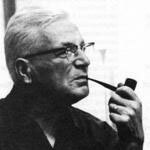 Indeed, the church has no ontological reality, but only a strictly functional one that “happens in so far as it actually proclaims the kingdom to the world” (334). Church planting is a wholly inadequate goal for missionary work, which ought to participate in the Mission of God directed towards the ends of the earth and end of time (336). The church is nothing other than an “apostolic band,” best conceived as “the movement between kingdom and world, related to both; it is an apostolic event before we can even think of it as an institution” (336). The church, according to Hoekendijk, had no nature apart from its missionary function. Moreover, “the Church can never be 'more' than the Mission” (335). On the basis of this conviction, Hoekendijk decried the scandal of the church’s outsourcing of its constitutive action: mission. Addressing the World Council of Churches, Hoekendijk asserts that the proper definition of oecumenical as “descriptive of all that is related to the whole task of the whole Church to bring the Gospel to the whole world,” is interchangeable with “apostolic” (336). In 1962, at the invitation of the International Missionary Council and the World Council of Churches, Johannes Blauw wrote The Missionary Nature of the Church, in which he surveyed what had been said in the previous 30 years on the relationship between the Church’s missionary calling and the shape it ought to take. Blauw attempted to approach this question biblically, thus he drew heavily on biblical scholarship and structured his book around study of the Old and New Testaments, with the better part of his final chapter devoted to 1 Peter 2:1-10. Importantly, Blauw saw mission not only as a consequence of the Kingdom, but as its actualization: “The proclamation of the gospel is the form of the Kingdom of God” (105). To restate it, the Kingdom is present where the Church is in mission. Hence, Blauw claimed his “conviction that the Church has been manifested more clearly in the much-defamed groups of “friends of mission” than in the “official Church,” which at best accepted a benevolently neutral attitude toward mission” (113). With the kingdom in view, Blauw emphasized the eschatological nature of the church, something which had been stressed in recent decades. He engaged head-on with Norman Goodall’s question: “Have the ends of the earth a theological significance comparable with the end of time?” (108). In response, Blauw offered a caution. Unless the conception of the “ends-of-the-earth” was purified of its non-Biblical Western association with bridging East-West and White-Colored divides, it should be regarded as theologically illegitimate. The missionary nature of the church, Blauw asserted, rests in the church's call to those who do not know God, geography and race aside. Blauw drew out of his survey the conclusion that “centuries-old ecclesiology” was being replaced by one which was both eschatological and missionary (120). 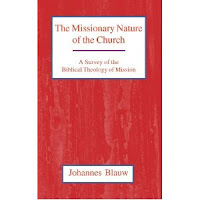 In conclusion, Blauw claimed it was the opinion of the great majority outside the missionary movement that “the Church is a missionary Church or it is no Church” (120). The church comes to itself by going outside itself, therefore, mission work is not just one of the church’s activities, but “the criterion for all its activities” (122). Thus, “theology of mission” must be synonymous with “theology of the Church” (126). Blauw summarized his view clearly: “There is no other Church than the Church sent into the world, and there is no other mission than that of the Church of Christ” (121). After five meetings beginning in 1962, the World Council of Churches published the report of the Western European Working Group for the Department on Studies of Evangelism, titled “The Church for Others” (1967). The distinguished roster of members and consultants is too long to list, but was organized under Executive Secretary Walter Hollenwager. The report began with a subtle rebuke for church leaders who regarded missions as a way to fill empty pews, with the declaration: “The missionary Church is not concerned with itself--it is a Church for others” (7). This report grappled with a secularizing world, and pleaded that the church not regard its “change of social function” as a “loss or emigration from society” lest mission be understood as “a counter-attack to restore” Christendom (10). De-churching, the report declared, is not synonymous with de-Christianization (10). In fact, secularization could be seen as a fruit of the gospel (10). Moreover, the report called attention to “Christ outside the walls of the Church” as indicative of the need for the church to seek traces of Christ’s transforming work “among men who may have little or no connexion with the churches as they are today” (11). This included those of other faiths, for there “is no true Church without a humble dialogue with non-Christians or without fellowship with them” (12). The church, instead of being the locus of God’s presence and activity in the world, then, is to be seen as simply a “part of the world which God loves and to which he reveals his love” (12). What makes the church unique is that it is the part of the world that “is conscious of the fact that it is moving towards this final goal” under God (13). Revelation happens in the world, thus “the primary context of mission is history” (13). The missio Dei happens in history, therefore missions means participating in historical work. Because God is ceaselessly working in the world toward shalom, “It is the Church's task to recognize and point to the signs of this taking place” (15). With this vision, the report called for a rearranging of the God-Church-World schema which envisioned God relating to the world through the church and instead called for a God-World-Church framework in which God relates to the world directly, and of which the Church is a part (16). Indeed it is through the world that the Church must meet God. The world, not the church, is the focus of God’s mission and plan. The role of the church in the world is not to draw the world into its ecclesiastical structures so that the world might relate to God, for God already must be seen as relating directly to the world in history. As a result, the church must “repent” of its organizational and liturgical forms and adapt these for relevance. The result of the new schema, according to the report, is that “it is the world that must be allowed to provide the agenda for the churches” (20). This entails, first, abandonment of self-serving aims pertaining to increased church membership, and new commitment to messianic service. Second, with the help of sociologists, the church is to discern the work of God in the world—in such things as freedom movements and industrial mission. Its mission, then, is to lend its energy, and theological vision (15). The “basic missionary act” is “sharing and participating” with the world (24). In conclusion I will highlight a number of the striking areas of agreement and conflict in these three documents. All affirmed the centrality of mission for the church, even as each elevated mission above ecclesiology by proposing that it be derived from mission. Hoekendijk and Blauw together denied the church any nature distinct from its missionary action. All three could describe God’s mission as the “the criterion for all the churches activities” (Blauw 122). Each invoked the kingdom as a central theme for an understanding of the church and mission. Eschatological themes were present in each document, evincing progressive views of history toward its God-ordained fulfillment. The contrasts between these documents are even more pronounced. Blauw and Hoekendijk could not disagree more sharply regarding whether to equate “theology of mission” and “theology of church”. Hoekendijk and Blauw agreed on the appropriateness and urgency of proclamation of the gospel, while the WCC report disparaged proselytizing as a misguided attempt to recover Christendom. These two also agreed against the WCC report, that locating mission outside of the church proper was scandalous defeatism. Hoekendijk’s consultancy for “The Church for Others” is evident in the similarity of his kingdom-gospel-apostolate-world framework with the WCC’s God-World-Church, both of which radically decentered the church and brought the world to the fore. In this respect, these two stand together in critique of Blauw’s assertion that “there is no other mission than that of the Church of Christ” (Blauw 121). Blauw, Johannes. The Missionary Nature of the Church. McGraw-Hill Book Company: 1962. Hoekendijk, Johannes. “The Church in Missionary Thinking” in International Review of Missions. Volume 41. Issue 3. 1952. Western European Working Group and North American Working Group on the Department on Studies of Evangelism. The Church for others, and The Church for the world: A quest for structures for missionary congregations. World Council of Churches: 1967. Thanks, JR! There was certainly some interesting debate going on before I was born about missional church even before the term was born. Hi there - am doing a Masters paper on the Church for Others, and wondered if you could advise where I can get a copy of the WCC study from 1967? Am getting nowhere in my search?! Many thanks! Thanks Christopher - am in the UK, so can't buy there, but since posting have found a copy (a little more expensive!) on the UK site. I guess I was hoping to find a pdf copy online somewhere! Thanks and God bless.